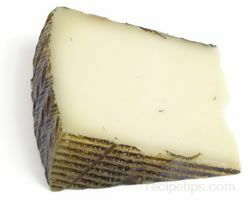 A Spanish cheese made from sheep's milk, firm in texture with a mild, nutty flavor. The rind is buff, gray or black colored and has a herringbone pattern, which is formed by the mold in which it is aged. The color of the interior cheese, its firmness and its sharpness will depend on the length of the aging process. Other cheeses, such as Romano, white cheddar, Parmesan and Monterey jack can be substituted for most uses.